If your a dog owner something you should always be aware of is Ticks on your dog. There are two main types of ticks that can affect dogs. There are Brown Ticks that will irritate your dog and Paralysis Ticks that are very dangerous for your dog that can kill your dog in a very short time. They both look very similar to each other. Signs of Paralysis Ticks can be your dog stumbling, unsteady, weakness in the legs, choking cough and having trouble barking. 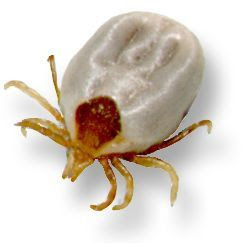 To find a Tick on your dog it is a better idea to feel for the Tick then to just look. Areas where you should feel your dog for Ticks is around the Front Legs, Chest, Neck and Head. If you notice any of these signs in your dog its a good idea to contact your vet as soon as possible. Frontline Plus Flea and Tick Control Treatment For Dogs is a great way to protect your dog against Ticks. Frontline Plus protects your dog from Paralysis Ticks for 2 Weeks after treatment. The Flea Control part of Frontline Plus will Protect your dog for 1 Month. So if your in a high Tick area make sure you repeat the treatment of Frontline Plus every 2 weeks. You can buy Frontline Plus Flea and Tick Control Treatment from Petsofoz.com Online Pet Shop. Advantix Flea and Tick Control Treatment for Dogs is another way you can protect your dog from Ticks. Advantix prevents your dog from getting Paralysis Ticks, Bush Ticks and Brown Ticks. Advantix will Protect your dog from Ticks for 2 Weeks after you apply the application and it will protect your dog against Fleas for 1 Months after Application. Advantix also repels and kills Mosquitoes and Sand flies. When your in a area where there are Ticks make sure you re-apply Adantix every 2 weeks. You can buy Advantix Flea and Tick Control Treatment from Petsofoz.com Online Pet Shop. I use advantix on my dogs and it works great for me.